An application has been submitted to the Bricktown Design Review Committee to construct a 5-story, 126 room SpringHill Suites on the southeast corner of Sheridan and Byers in eastern Bricktown. This is the same owner and architect that last year proposed the controversial Deep Deuce SpringHill Suites (follow link) that was proposed just a few blocks away. That application was ultimately withdrawn due to concerns by neighbors and the design review committee. This project will be brick on the first four levels and synthetic stucco on the top, 5th level. It will also feature an bar, breakfast area, indoor pool, fitness area and meeting rooms. While it's a bit difficult to discern from the renderings below, above the 1st floor the structure will be a u-shape facing north along Sheridan Avenue. The applicant also owns the parcel directly east of this and has stated he hopes to construct another hotel on that site as well. The project site is directly south of the proposed Steelyard apartment complex, which will also feature some retail and a Hyatt Place hotel. Along with the other recently completed and proposed hotels in the downtown area, this new facility would bring the total room count to 3,666 in 18 separate properties. See our Downtown Hotel Summary for complete details and links. I don't understand why they always put stucco on the top floor. Why not brick all the way up? This guy must hire the cheapest architect money can buy. These renderings will not pass design review. This is pathetic. Just because its brick he thinks it is good. Holiday Inn Express used brick to the top. I believe the BT design standards require a certain percentage of brick; developers often use only the percent required because EIFS is cheaper. I hope this doesn't pass review. There should be no U shape facing Sheridan. Needs to fully face that street. Reading the project description and justification above has my wondering, how can forcing the building to be built all the way to the sidewalk cause the price to go up? Back when I was a City Planner it was the landscaping and parking requirements that prevented the project from being viable. Most developers wanted to use as much of their lot as possible for revenue generation. As for the EIFS, they spelled it out pretty well; not using it would be in conflict with the design character established by previous projects (i.e. the hotels next door). Alas, I don't know why laying this stuff out on the ground is so darn hard so let me explain to the developer once again: street-tree-sidewalk-building. It is just that darn simple. Stop putting the landscape between the sidewalk and the building - THIS ISN'T SUBURBIA! (1) The setbacks for new buildings and additions to buildings should be in keeping with other buildings on the block. Normally, new buildings should be located on the front and side property lines. Where new buildings are not situated on the front and/or side property lines, the setback area should be designed and landscaped so as to complement the existing facilities within the core area. The historic character and texture of the area is best served through the observance of platted building property lines. (2) Brick building facades, preferably varying shades of red brick, are an established and a critical characteristic of the district’s core. New and renovated facades should enhance or complement this characteristic. Innovative design and creative use of building materials, such as glass, concrete and architectural metals are encouraged. Mirrored glass and vinyl siding are discouraged. (3) Buildings should have the appearance of a flat roof from the ground, and pitched roofs should be hidden by parapets. Roofs with other appearances should be closely reviewed for the district’s architectural improvement and for design impact on the district and adjacent structures. (4) Window alignment and type should be compatible with adjacent buildings. I don't not like it. Without more detail, I can see that it generally fits the historical pattern of an old brick warehouse district. This area was never ornamental; it was an industrial and warehouse area. This could be considered in keeping with the historical appearance of the area, excepting the bowed section in the middle. And, since historic preservationists prefer differentiation, the bowed section could be considered appropriate because it presents a visible clue that this is new. I do, however, agree that the EIFS is silly if you're already bricking 4/5 floors. Just do it all. Another possible reason for using EIFS is to break up big, rectangular surfaces and provide some color and interest. Certainly, signage stands out more against the lighter colors than it would on brick. So are we talking about brightly colored EIFS? I'm sure it will be beige-ish which is a lot better background for brightly-colored signs. A bit blah. These hotels are all starting to look the same. Maybe I'm just taking it for granted there's so much hotel construction in that area, but even the Holiday Inn Express was able to "jazz it up" a bit. Is it just me or is there no sidewalk in front of the hotel? Wow, another cheap hotel in Bricktown, I can't wait! They should do a blade sign if they want to project class. It will also be provided with a Meeting room, an Indoor Swimming Pool and other Brand elements like Breakfast areas and guest rooms. I am glad that Marriott hotels have additional amenities that are standard with their brand, but shouldn't all hotels have guest rooms? Glad to see you back, Larry! However, somewhere along the way, builders discovered that substituting EIFS for the cast stone or brick actually saved a bunch of money too, so they fully embrace the design for economic reasons, though it began for aesthetic ones. Yep. I'm able to see a permit ap, get info from the city on the same schedule you do. There's nothing special accomplished here Pete. You're scrapping the city's website. So am I. Interesting. 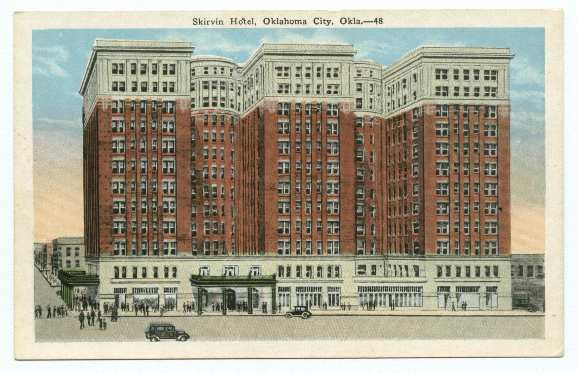 Did the Skirvin ever actually look like that? There are cast stone pediments running up the top few floors, and the "balcony" railing is in the same material, but brick runs all the way to the top as the predominant material. This. Who cares about all these "blah" developments. Let's get a Westin, W, Omni, Hyatt Regency, etc. That'll be worth talking about (or staying at! ).